When Will the Canadian Housing Bubble Burst? Despite all this talk of a housing bubble in Canada, prices are still going up. Even sales - which were falling for quite some time - rebounded this past July. 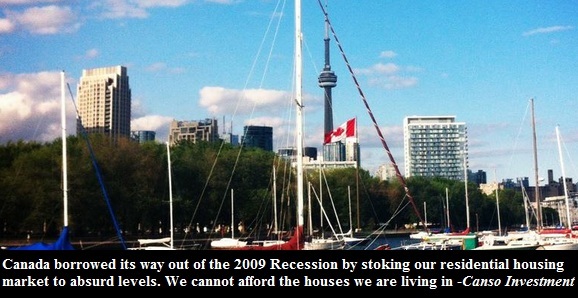 Jim Flaherty says that the housing bubble was averted. But was it really? If there is a housing bubble in Canada, when will it finally burst? No one can tell for sure. Still, I will try to present a rough estimate based on Google trends data. You see, in the United States all the bubble talk started way before home prices crashed. 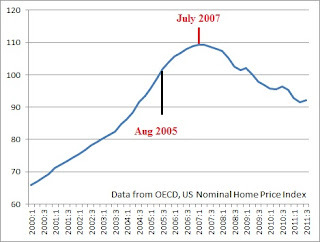 If you look at Google Trends data, the American search volume for the term "housing bubble" peaked in August of 2005, roughly two years before the nominal home prices in the United States started to decline. The graph above shows a monthly American search trend for keyword real estate bubble while the chart below shows nominal home prices in the United States. If you compare both graphs you can make the following statement: when people were talking about the housing bubble the most, home prices in the US were still about 10% away from the peak. So don't be surprised with so much current bubble talk here in Canada that the prices are still rising! After the bubble had popped in the US people were no longer concerned with the housing bubble. Instead people were worried about the housing crisis - and that was exactly what they searched for. 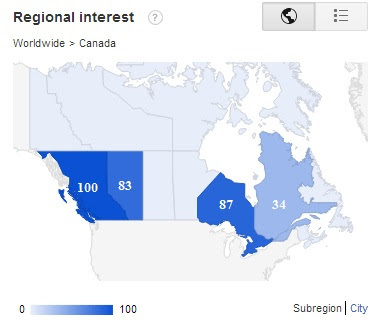 Now let's take a look at Google Trends data for Canada. The graph below is quite different from the one for the United States. Canadians seem to exhibit more or less steady interest in the Canadian housing bubble. The steady interest in the subject matter can be due to Canada's close proximity to the US - who just experienced a housing bubble. Nonetheless the search volume peak is still identifiable. As you can see the Canadian search volume for the term canada housing bubble peaked in May of 2012. If Canada's real estate market were to behave just like the US market did, it would mean that the housing prices would begin to decline around April of 2014. Obviously the Canadian real estate market is different from our neighbors. Thus April of 2014 serves a figurative role to demonstrate the point that housing bubble talk peaks a few years before the bubble actually bursts. Note that the reason for me using the term canada housing bubble (2,400 monthly searches) and not housing bubble is because Canadians tend to search for the first term much more often than the second (590 monthly searches). Similarly, the most searched term in the US was housing bubble. Also I want to quickly mention that Canadians have expressed almost identical search interest for their own housing bubble as Americans did. There were 77,142 Americans searching for the term housing bubble during the peak while there were only 7600 Canadians searching for the term canada housing bubble. The thing is, Canada's population is almost ten times smaller. Thus, adjusted for the population, the search volumes are nearly identical. 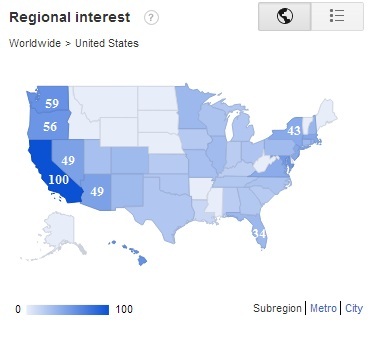 Finally, the last two charts show the regional interest in the discussed keywords. Not surprisingly the worst hit states had the highest interest in the term housing bubble. Guess which province is going to be hit the worst once Canada's housing bubble pops?